$15 off, or save $80 when you buy 4. This isn't just _a_ light fixture, this is THE light fixture for UVB production. Custom made for Solacure, specifically for use with our horticulture lamps, such as the Flower Power Series bulbs. It's an all steel fixture designed for ONE 4 foot bulb, either F32T8 or F40T8, and is powered at 32w. 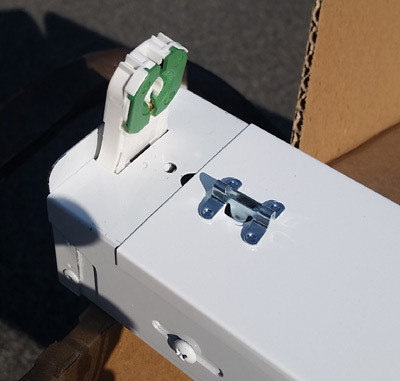 This is designed to provide 32 watts of power to ANY of our 4 foot lamps, or you can double wire the ballast (takes 5 minutes) for twice the power in greenhouse applications. Has a long cord and plug and can be connected to any 120v outlet. * 5 foot cord (NEMA 5-15, standard 120v). Can be easily cut off to connect to 208v or higher. * 2.5" x 2.5", so it has a low profile and doesn't block other lights. * Powdercoated solid steel design, no tools required to get inside case. * ETL listed, certified for damp locations, meets code for ALL areas. These are mainly used for horticultural purposes, using two of these fixtures per 1000w hood if you use the Flower Power, or using 4 if you are using the Universal UV bulbs. Built for and back directly by Solacure. One year warranty. Note: We source these from two different suppliers, American and Asian. This means that orders of multiple fixtures may have two different kinds.